If you guessed an investigation by the Pentagon inspector general and serious allegations of plagiarism, you are correct. Rep. Devin Nunes, R-Calif., the chairman of the House Permanent Select Committee on Intelligence whose family hails from Portugal, is waging war on the Defense Department’s plan to draw down U.S. forces at Lajes Air Base on a small Portuguese island in the Azores and reassign military and contractor personnel to a new, modern facility at the British Royal Air Force Base at Croughton. In addition to saving money, the move is in response to an aging infrastructure at the current JIAC in Molesworth, U.K., and the lack of sufficient IT communications infrastructure in the Azores. 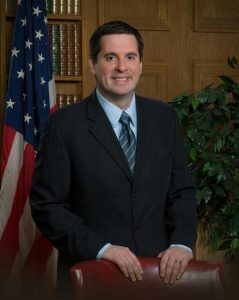 But Nunes this week waged an unusually vehement defense of his family’s homeland (unusual in that he represents the people of California, not the people of Portugal) when he called Director of National Intelligence James Clapper and Deputy Secretary of Defense Robert Work to testify before the committee, and proceeded to prosecute his case based on Wikipedia and tourism anecdotes. In March, Work met with Nunes and other lawmakers to provide written justification (as a required by the Defense Authorization Act) for the Pentagon’s decision not to move personnel from Molesworth to Lajes. And while the intent was to lay out the communications bandwidth requirements for the JIAC and show why the Royal Air Base in Croughton was a much better communications hub than Lajes, Pentagon IT officials (from the department’s CIO office and the Defense Information Systems Agency) did the unthinkable. “Secretary Work, are you aware that significant portions of this document that you passed to three committee chairmen to meet a public law were plagiarized from Wikipedia?” Nunes asked. Pause here for uncomfortable shifting in one’s seat. “I’m just alarmed…that we would rely on Wikipedia, a free online encyclopedia that’s famously known for most high school students plagiarizing their homework and that the Department of Defense would even use Wikipedia…to provide any information to Congress to put in any report,” said Nunes. Because the consolidation of facilities will impact the National Intelligence Program budget, Clapper was forced to weigh in on the matter. During briefings last year with the commander of the JIAC at Molesworth, Clapper said he was informed that civilian contractors working at Molesworth had outright refused to move to Lajes. “Sounds like we are making decisions based on where people want to live,” Nunes shot back. “You know these are older people who have children in schools, particularly high school age, and I think that the general reaction to that—to move to an island in the middle of the Atlantic ocean—was not very positive,” Clapper said. “You have to put this into the context of what this question is about,” Work said. ” ‘What was better, Croughton or Lajes?’ There is no comparison. Croughton is absolutely the best information hub,” he told Nunes. And that’s when Nunes’ argument went from the ridiculous to the absurd. “Are you aware that the Azore islands are a popular vacation spot for people from the U.S. and Europe and have daily flights?” he asked Clapper. Clapper paused for a moment, the wheels clearly spinning, wondering if he should allow politics to trump the realities of bandwidth.